Some would call it human nature, but perhaps it is more accurately described as a human weakness. I’m referring to our common desire to sugar-coat the truth, making things appear better than they are. People in recovery know what I am talking about. To everyone except a select few, the years of active addiction are often described as “not that bad,” at least compared to other people who could be mentioned. When asked about their recovery today, the most frequent response is “great,” or “my life could not be better.” Denial, the most obvious symptom of addiction, can easily become the mask behind which we hide the truth. Life is hard, imperfect, and there are always struggles – which does not mean that it isn’t wonderful and precious. 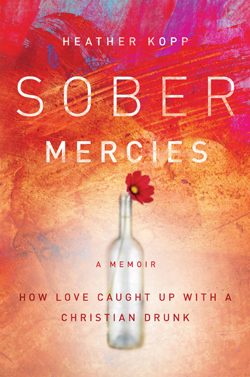 Recently I received a book mailed to me by the publisher: Sober Mercies by Heather Kopp. The subtitle is “How love caught up with a Christian drunk.” I set the book aside, fearing that it would be like some others I have read that provide a bit of personal sharing and then launch into a sermon that is far too long and much too self-righteous. A few nights ago I picked up the book, ready to give it a quick scan before confining it to an obscure corner of my library. Boy, was I wrong! Heather Kopp is a Christian and she speaks about her faith. The book discusses the importance of discovering and trusting a “higher power.” The reader is able to share in Heather’s struggle to understand who God is and how he intervenes in her life. As the story unfolds, we see God travel from Heather’s head to her heart. I encourage you to buy this book. Read it and share it with others who are in need of recovery, or who have begun the journey and want to see it to the end. Because this story is REAL it has great power. Let it touch you as it touched me.